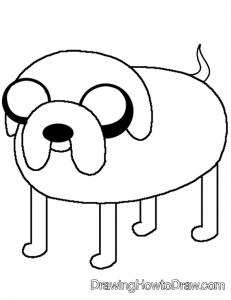 Today I will show you how to draw Jake the Dog from Adventure Time (a popular new cartoon show on Cartoon Network). 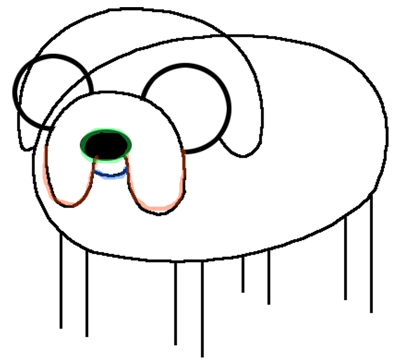 Jake is a shape-shifting bulldog whos best friend who inexplicably gained magical powers while rolling in a magical mud puddle when he was a puppy. His powers help Finn the Boy considerably in combat, but are also sometimes used just for jovial forms of expression. Below you will find a simple, step by step drawing lesson that kids, teens, and older adults will be able to achieve. Have fun. Here are More of Our Adventure Time Tutorials. 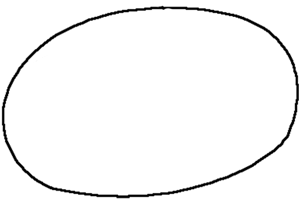 Start off by drawing Jake the Dog’s body by drawing an oval, as pictured above. Now lightly sketch 2 circles, and then erase the bottom part of the circles’ shapes. 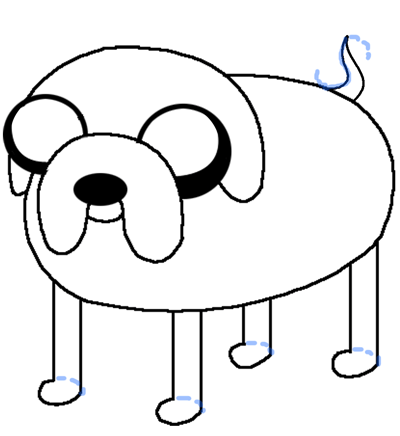 Above, is what Jake should look like so far. Now draw 4 legs by drawing thin / long rectangles as pictured above. 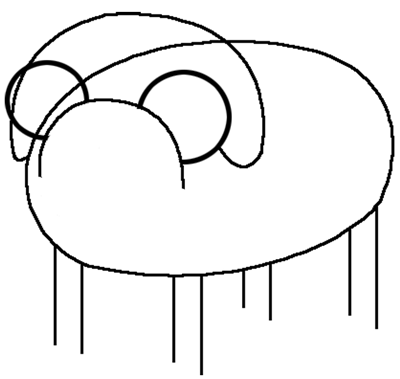 Now draw The outsides of Jake’s eyes….they are both circles that are cut off by the inner line that makes up a snout. 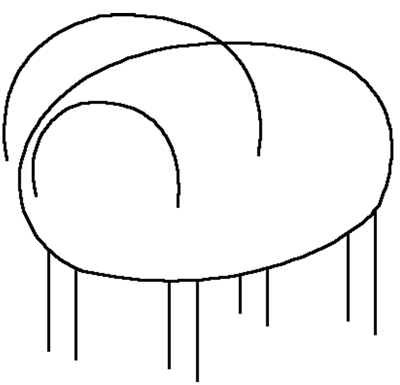 Also draw Jake’s ears by bringing the outside lines inwards (like a letter ‘J’) and bring them up to the eye. I highlighted (in different colors) the lines that you need to draw in this step. In green, draw an oval for the nose. In red draw 2 letter ‘U’s. In blue, make a curved line for his mouth. Draw Jakes feet by drawing ovals at the very end of the rectangles that you drew a few steps back. 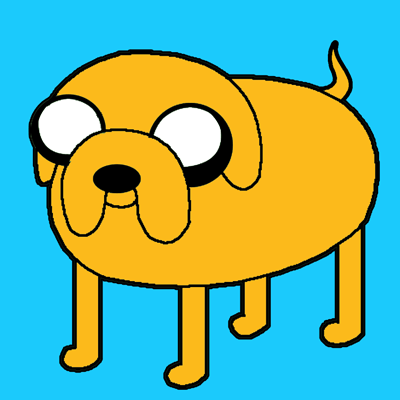 Also start Jake’s tail by drawing a sideways ‘s’ like shape. 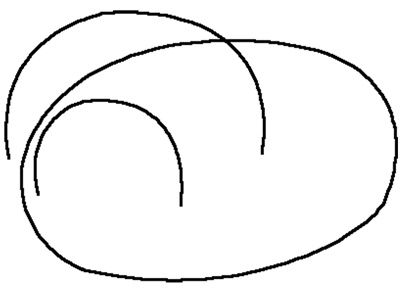 Draw another ‘s’ like shape to finish off the tail. Now draw large black curves on the outside part of each eye. 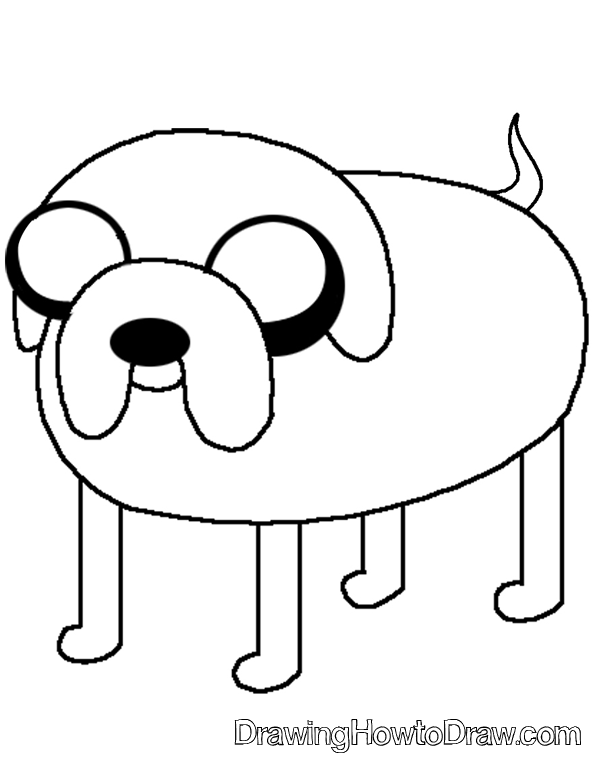 Jake the Dog is finished now…just darken in the ‘correct’ lines and erase any mistakes or guidelines that you drew in previous steps. Here are More of Our Adventure Time Tutorials. 🙂 JoJo – just try again if you don’t like how your drawing turned out. Practice, practice, practice…thats how I got good at drawing and i can work for you too! WOW i ALWAYS WATCH ADVENTURE TIME BUT i DONT know how to draw jake but thanks to this page now I know how to draw jake its also quick and easy thanks. I like jakeeeeeeeeeeee and I like finn toooooooooo!!!!!!!!!!!!!!!!!!!!!!!!!!!!!!!! thanks1 this was super easy and i finished in like five minutes!